As spring moves toward summer, another season comes to an end. 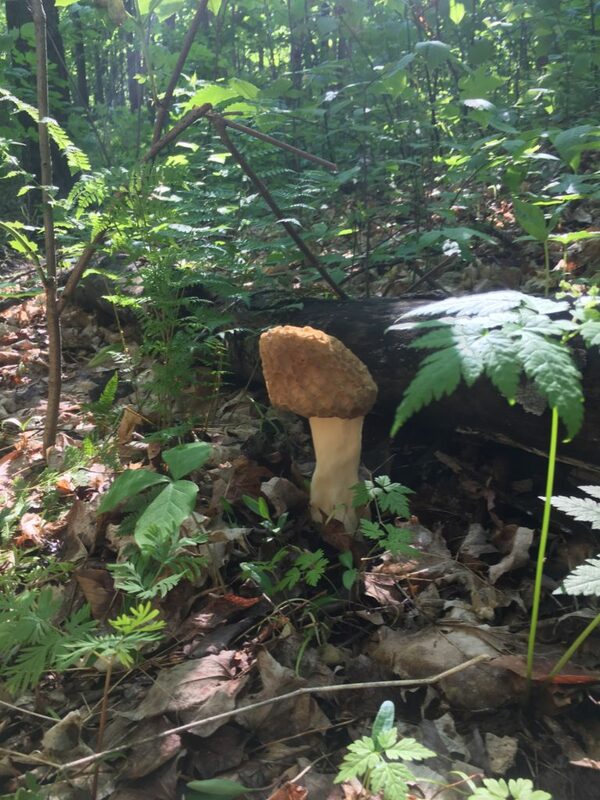 Morels, an edible mushroom, slowly start to rot away as average temperatures increase. Although a great foraging opportunity has yet again come and gone for us, many wildlife species are just beginning to expand their diet. Below, a Jack-in-the-pulpit was eaten by a turkey. 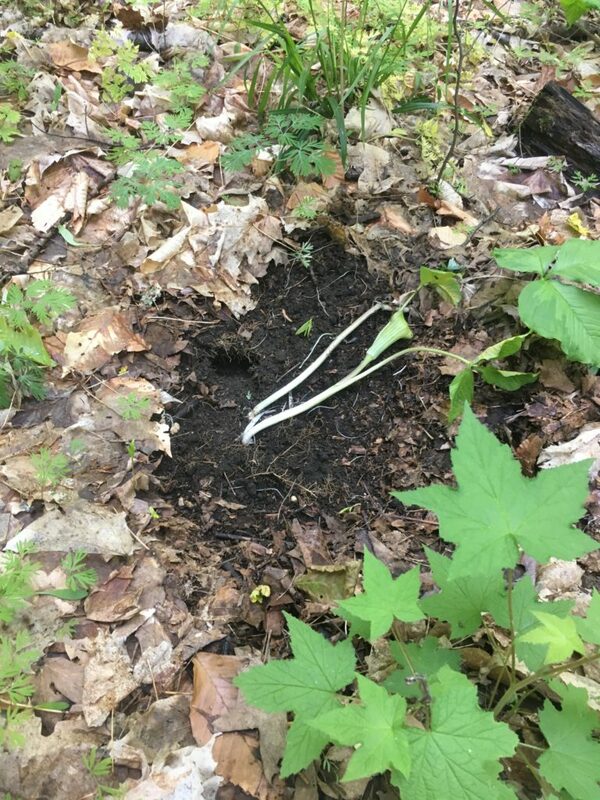 The tuber root from this plant feeds various wildlife and is a black bears favorite snack after a long winter. This entry was posted in Uncategorized on June 6, 2017 by pbartlett. In 1982 Patrick was the crew leader on this Cable Logging project in Vermont. This entry was posted in Uncategorized on April 9, 2015 by pbartlett. 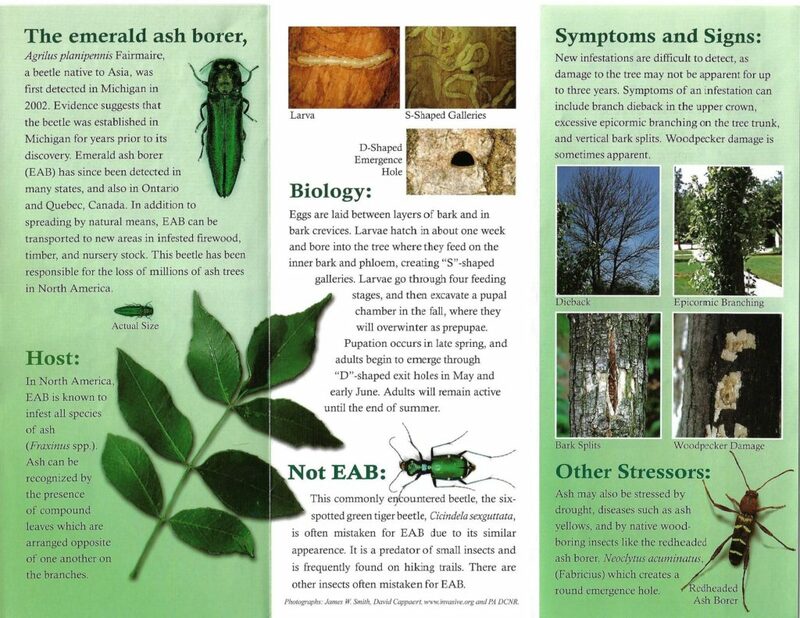 This article first appeared in Northen Woodlands on June 1st 2006 by Patrick Bartlett. 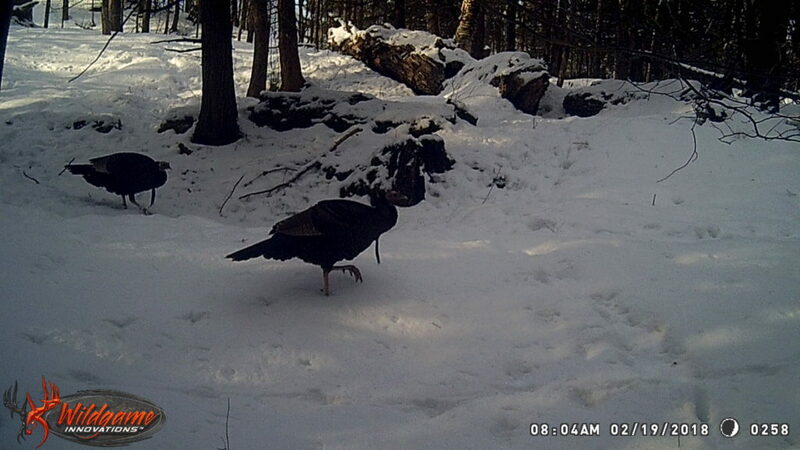 Working as a consultant forester, I get to see some unusual things in the forest, but what I found last winter on a woodlot in Ludlow, Vermont, truly amazed me. This woodlot is owned by Charles Miller and was formerly managed by the late Myron Smith, my mentor and good friend. Myron often carried an axe with him and girdled low-quality trees as he saw fit, to allow better trees to grow. The two white pines in the photo were joined by a limb from the smaller tree at a young age. I assume that when Myron found these trees 15 years ago, the smaller tree had a severe blister rust canker by the ground. He then chose to cut the tree with his axe, hoping that the bigger and better tree would have less competition from the diseased tree. I’m sure he assumed it would break away from the crop tree that was holding it up that day and never dreamed that the limb connecting the two trees 24 feet off the ground would support and keep the entire cut-off tree alive. 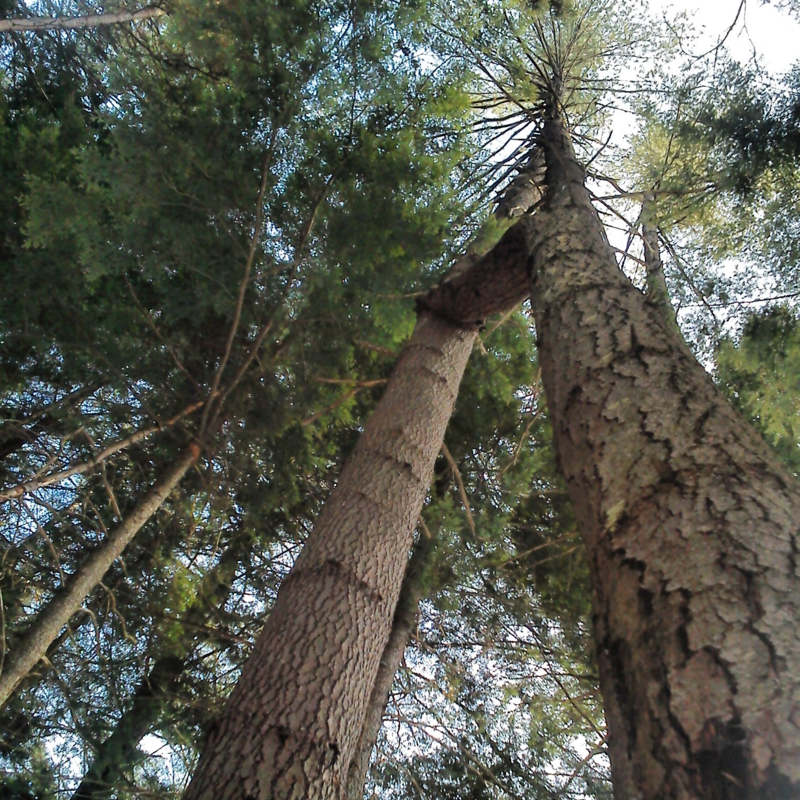 The smaller white pine that was cut off now is 75 feet tall and has a 10-inch diameter at breast height (DBH). The bark is still alive from the base to the top of the tree, and its entire crown still alive. 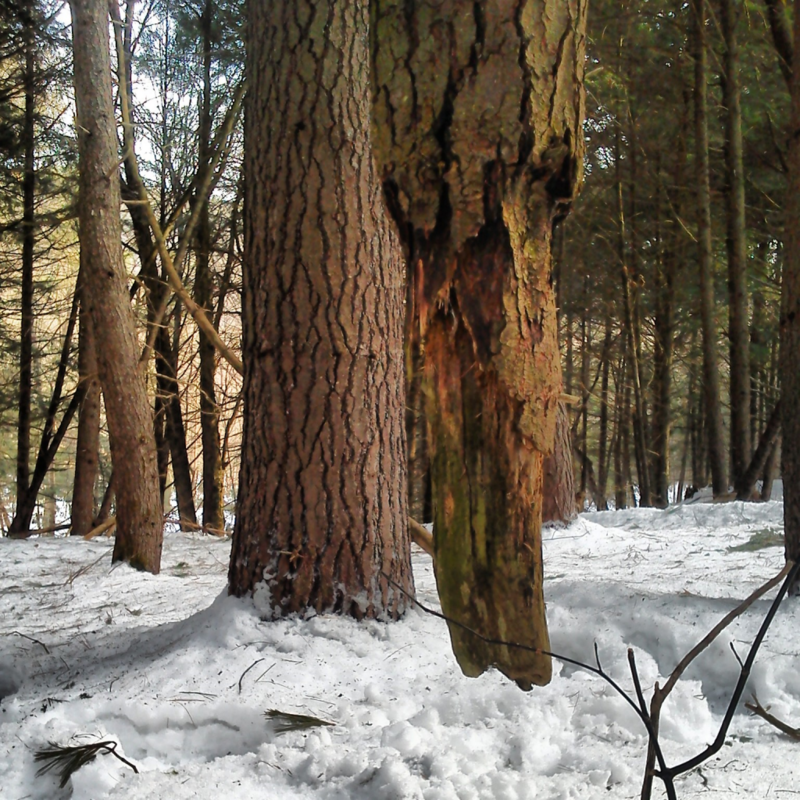 The white pine that supports this tree is 14 inches in diameter and is the same height. This is truly a miracle of nature, for a white pine to survive not only the blister rust disease but also being cut off from its root system. This entry was posted in Uncategorized on January 27, 2014 by pbartlett. Getting red oak regeneration to survive and become a tree is frustrating to say the least; foresters and wildlife managers know this all too well. I have been planting red oaks for a number of years and would like to share some of my trials, errors and successes. If you learn from my mistakes, you should have a 90% success rate in growing oaks. Collecting acorns and throwing them around on a hillside is basically a waste of time. These nuts have an aroma that gives them away to the animals that cherish them; most will be eaten in days. Planting a germinated acorn in April or May will reduce the chance of it being eaten before becoming a seedling. 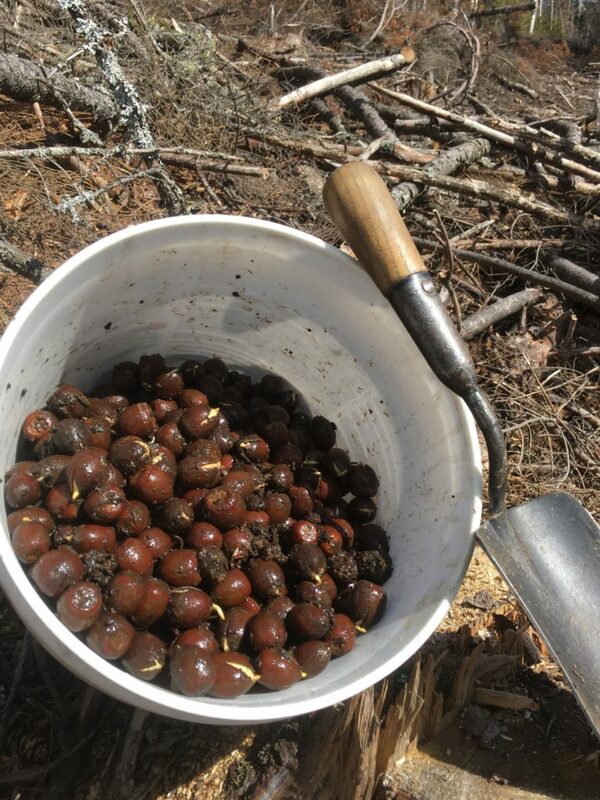 The best way I have found for germinating acorns is to collect acorns in the fall of the year, and place them in a bucket of water after collecting them. Fertile acorns will sink, throw the floaters away. Place the good acorns in a sealable plastic bag and put a very wet paper towel over them. I store mine in a one gallon, clear, zip-lock baggy with a wet paper towel. I keep it in the vegetable drawer in the refrigerator. Burying them in the bag in your garden 12″ deep will also work. If you keep them in your refrigerator, 3 times during the winter the paper towel should be moistened again. If you are not seeing condensation on the inside of the bag then it’s too dry. The key is to keep them from freezing or drying out. When the end of April approaches, take the bag out of the refrigerator or garden. Wet the acorns down and keep the bag sealed and at room temperature for about a week. Within this time, roots will start to emerge. They should be planted before the root gets to be 1/2 inch long. I have had good results planting germinated acorns in poplar, white birch, spruce or pine patch cuts. The first spring after the cut has been done is the best time to plant. When I’m planting sprouted acorns, I just poke a hole in the ground one inch down, place it in with the root pointed down, then cover it over. The less you disturb the ground, the better. Squirrels will rob your sprouted acorn if they find it. I like to plant them under tops that have been left after a timber sale or in the center of a group of spruce seedlings. 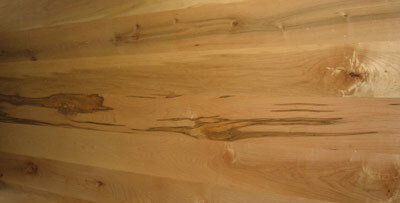 Spruce tops take years to rot and will protect the oak seedling. Leaving tops whole is recommended to impede the deer movement. 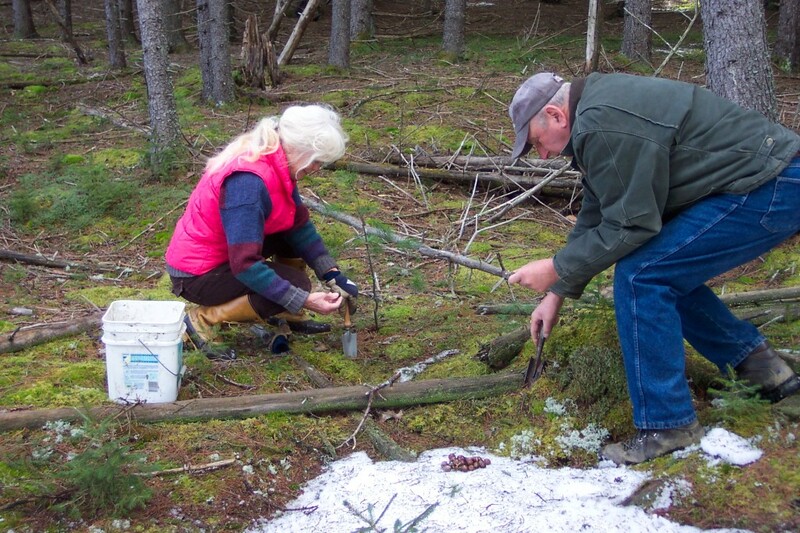 Planting acorns with a group of spruce seedlings that are six to twelve inches tall is like having a live, natural barrier from the deer. 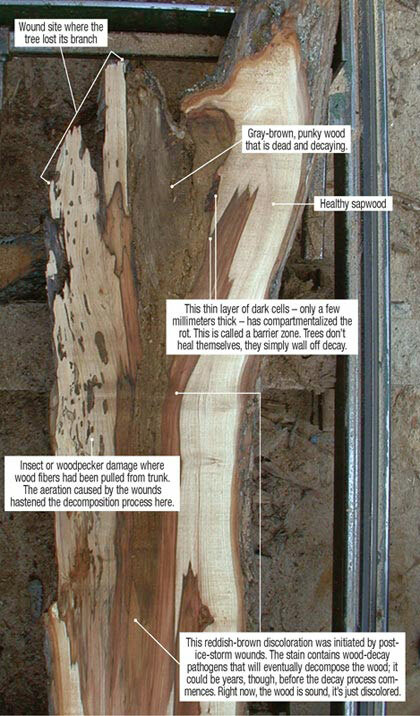 Avoid planting the acorns where there is established hardwood regeneration. If you want to go one step further in regenerating oak trees, it would be to provide a man-made shelter for the vulnerable oak seedlings. 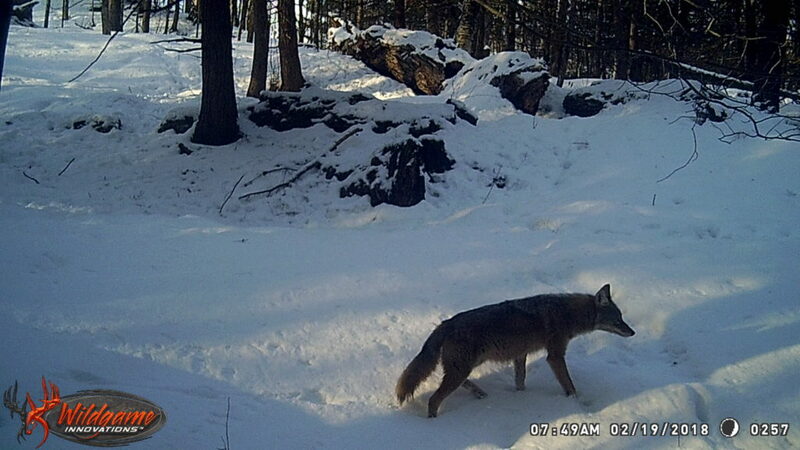 Obviously this is a more expensive approach but is worth it if you have a deer browse problem on your property. An annual spring check-up for at least six years is recommended so planting where there is easy access is also highly recommended. Raccoons and bears will sometimes disturb the tubes. There are a few companies that make this protective tube that is placed over the seedling. Treeessentials and Plantra are two brands I have used. I have planted approximately 600 oak seedlings in these tubes over the past eighteen years, which I have had good results with. The five foot tube is the one to use for deer protection. It is critical to sink the tube at least one inch into the ground around the seedlings so that mice will not nest in it and girdle your seedlings. The tube has one vase shaped end which should be pointed upward. 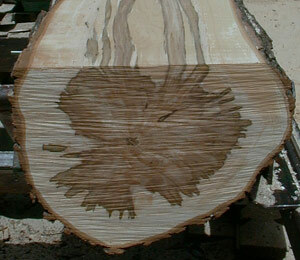 After the tree emerges, this tapered edge does less damage to the tender bark if the tree gets blown around in the tube. It also helps hold the netting on. 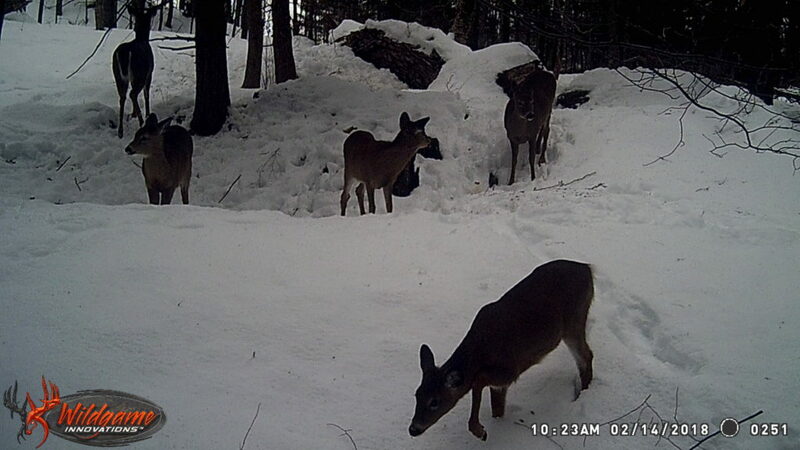 In areas where deer use is heavy in the winter, this will not be high enough once your seedling emerges from the tube. In this case, I slide the tube up the stake as the tree grows. The tubes come with two plastic quick ties for attaching to a stake. They also come with a netting that slides over the top of the tube. This is to prevent birds from becoming trapped in them and the new, finer netting design keeps wasps out of the tube. On one woodlot that I manage, there is a raccoon that has discovered that wasp’s nests can be found in these tubes with the old netting on them. It would chew through the tube to get to the wasp nest. The netting must be removed the year that you expect the tree to reach the top of the tube. I like to remove the the netting when the tree is within 16″ from the top of the tube in the spring of the year. Wooden stakes can be purchased with the tubes, however, I have recently started using 5/16 of an inch rebar instead. I can use these stakes repeatedly in my forestry business and in doing so it reduces costs for my clients. I cut a twenty foot section into three pieces. This stake won’t rot and will be long enough so that you can slide the tube up if you need to. I like to leave the tube on until the trunk of the oak is one inch in diameter. You will have to cut the tube to get it off the tree which I prefer to do in the spring. This gives the bark a chance to harden up and is not so tempting to mice or rabbits in the winter. Any sucker sprouts should be pruned off at this time. The saplings may be weak and should be loosely tied to the stake with something that will not damage the bark. I prefer to use stove pipe wire slid inside of old sugaring tubing that has been discarded. Most sugar makers have some lying around. Two year old container stock seedlings (not bare root) are recommended when purchasing oaks from a nursery. They should only be planted in the spring or fall when the moisture in the soil is high. The trees will generally grow twelve to sixteen inches a year in the tubes. I recommend putting a tablet of slow release fertilizer one inch down in the soil above the roots of the seedling. Granular fertilizer may be a lot cheaper but I have had porcupines smell the granular fertilizer. They have a craving to eat it and have dug the seedlings out of the ground to get at it. I have never had this happen with the fertilizer tablets. It is very helpful to pull in some leaf mulch and build it up around the seedling to help hold the moisture in the soil. I have had a 90% survival rate so far with the oaks planted in these tubes. Oaks love the sun, so it is important to plant them where they will get plenty of sunlight. If you are planting a small patch cut, plant in the center or the north side but not under the canopy of edge trees. Patch cut should be no less than a 1/2 acre in size and 1 acre is recommended. This may seem like a bit of work but after you do a few the planting time should be two minutes per tree with annual maintenance being around one minute per tree. Cost of trees and tubes will vary on how many you buy. The Federal Government has a program called WHIP that will cost-share for the planting of oak trees. I like to remind my clients that one good log from a timber harvest can pay for a small oak plantation. 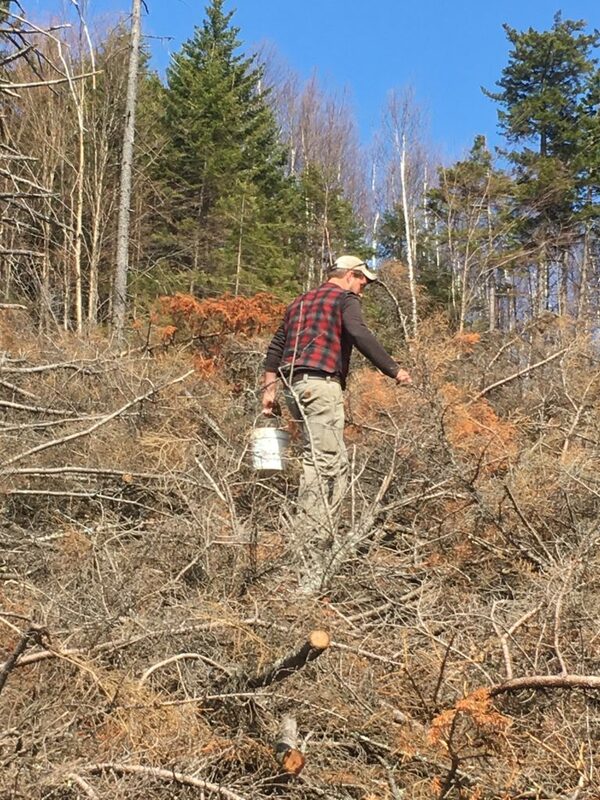 I encourage the landowners and children to help with planting these trees and they all seem to get a great deal of satisfaction putting a little something back into their woodlot instead of their bank account. Critics have stated that this is not cost effective forest management, however, I do not plant a dozen oaks on one hundred acres for harvesting. 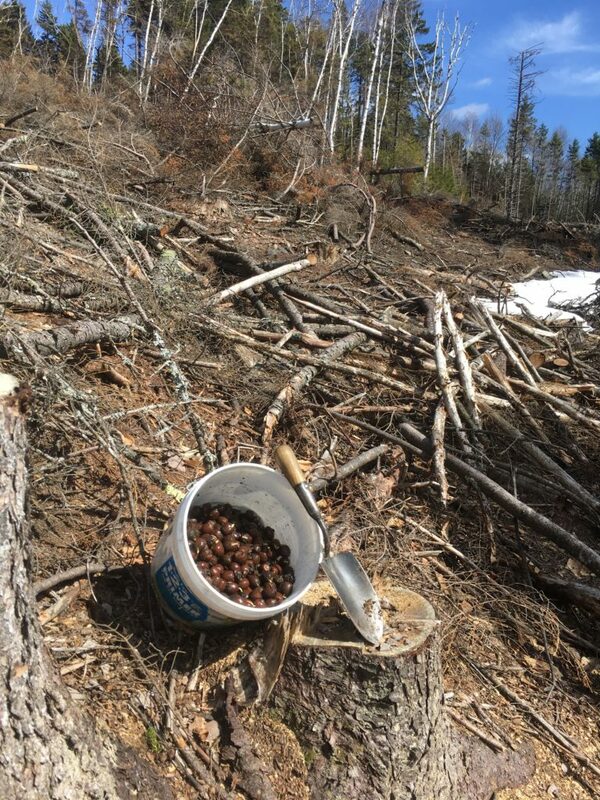 The concept is to provide a few trees that someday will provide food for wildlife, but more important, a seed source that will be spread around the forest for decades to come by the wildlife that feed on the acorns. 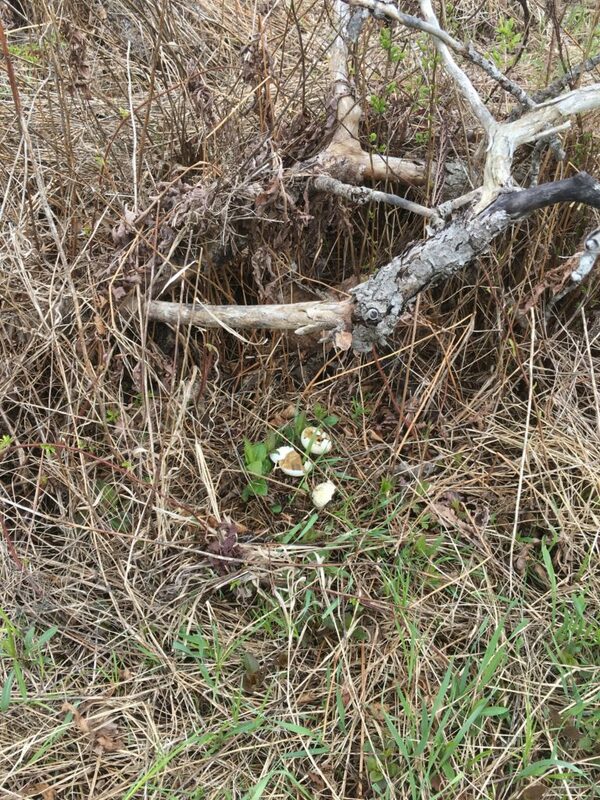 Deer population will continue to fluctuate, so when their numbers are low again, acorns from these trees will grow on their own.